At a young age, Dr. Reza Nabavian attended boarding schools in eastern England and central Italy. As such, he is fluent in Italian, English and Farsi. When he was a teenager, Dr. Nabavian moved to Washington DC to study Applied Physics and Electrical Engineering. During his undergraduate studies, he participated in the development of laser systems that were used to scan the human body in a project that was funded by the National Science Foundation. This experience spurred him to apply to medical school. “I became fascinated by the human form and the interface of technology and biology,” he says. “My colleagues tell me that my engineering background makes me see things differently than other doctors,” says Dr. Nabavian. “I think in terms of geometry and shapes. The thing that fascinated me about plastic surgery is how we study, change and shape the form of the human body. It’s the geometric and three dimensional aspects that appeals to me.” Because of this technical background, Dr. Nabavian has served as an independent investigator for the FDA studies of next generation filler proteins. In the aftermath of the January 12, 2010 earthquake in Haiti, Dr. Nabavian coordinated the medical and surgical relief operations for Artists for Peace and Justice (APJ), a star studded charity whose leadership includes Olivia Wilde, Charlize Theron, Paul Haggis, Clint Eastwood, Ben Stiller, Nicole Kidman, Penelope Cruz, Javier Bardem, Josh Brolin, Diane Lane, James Franco, Susan Sarandon and Gerard Butler. Currently, he serves as the Co-Chair of the Executive Committee of APJ’s Board of Directors, where he helps execute APJ’s philanthropic goals. Those include general relief operations and the building and operating of schools in Haitian slums. Dr. Nabavian has thus traveled to Haiti over a dozen times since the earthquake to lend a medical hand. “I go there to perform surgeries, support hospitals and rehab centers and to help kids with prosthetics,” he says. Dr. Nabavian has maintained his Santa Monica based private practice for over eight years. 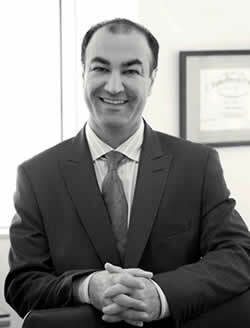 His specialty spans facial rejuvenation, body contouring and breast augmentation surgery. Dr. Nabavian particularly specializes in the use of a patient’s own fat cells in a minimally invasive procedure that targets visible signs of aging and avoids scars and overly pulled results. Fat can also be used to contour the body, by removing it from an unwanted area and placing it in a desired area. Indeed, Dr. Nabavain is preoccupied by a strong standard of ethics. “There is a component of retail in elective surgery,” says Dr. Nabavian. Patients come in and ask for something and pay for a service. In this scenario, patients become almost like customers. “As a physician, you have to be a doctor first, especially when it comes to plastic surgery,” says Nabavian. It’s exactly these ethical concerns that shape his teaching curriculum at USC. Dr. Nabavian is the Director of Aesthetic Surgery Education at USC where he serves as Clinical Assistant Professor of Plastic Surgery. In this capacity he teaches young plastic surgeons how to perform safe, effective and ethical cosmetic plastic surgery. Typically, the treatment of burns is urgently focused on saving the patient’s life. Dr. Nabavian incorporates aesthetic rehabilitation into the equation, where he concerns himself and his residents with minimalizing scaring and deformities as early as possible. “Most burn centers don’t have as much plastic surgery involvement,” he explains.